My toddler and preschooler boys love to help in the kitchen. We often bake cakes together. They love helping to prepare food - they make great banana sandwiches! And sometimes they just like to play with their wooden play food at the kitchen counter-top while I cook or clean. Step stools are not safe for small children. Even my 4.5 year old preschooler is barely stable. When my older son was 1 and very much wanting to see what I was doing in the kitchen we looked for a safer option than a step stool and found the kitchen helper. On this page we'll review the option that we choose and also provide a brief overview of alternatives. 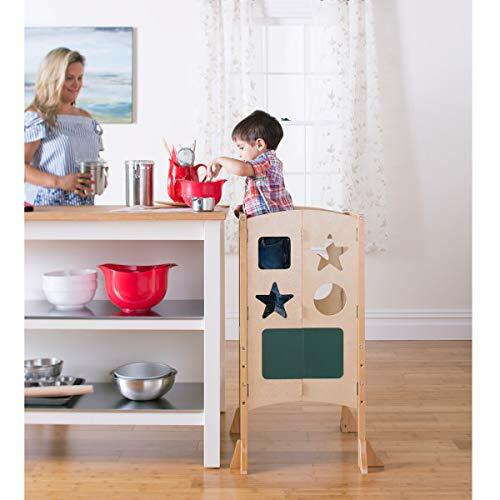 The Little Helper FunPod is our recommendation for the best kitchen helper for toddlers and little kids. We got one when my older son was around 14 months. 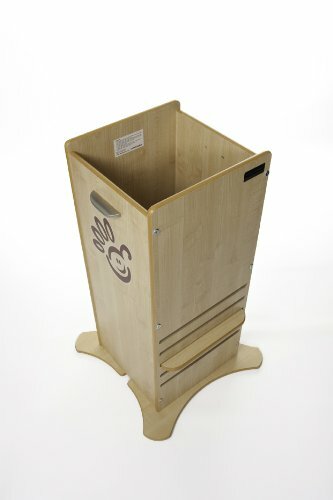 The FunPod can be used from age 1, basically once they can stand solidly, my son walked at 11 months so he was fine in it. He's now 4.5 (and can just about be trusted on a step stool) while his brother is nearly 3 and uses the FunPod regularly. The FunPod is really solid. It's very heavy which makes it very stable and safe. It's really simple to adjust the height, just pull out the base and push it into a different slot. It's also easy to pull out to clean it - toddlers helping in the kitchen are prone to dropping food! Yesterday my son used his FunPod to help me make scones. He stayed in there while I prepared lunch and then he was so happy in there that me and his brother pulled stools up to the counter-top to each our lunch. Although the FunPod is heavy it can easily be slid across my wooden floor. My children have spent many happy hours in front of the kitchen sink with some water and a few toys while I cook or tidy up. I chose the black color to match my black granite countertops. I almost wish I'd been brave and gone for the red as it's rather gorgeous! All the colors are lovely and will work in a modern kitchen. The natural and white are good options for a traditional kitchen. My only regret is that I didn't buy a second FunPod for my younger son, there was a long enough period when they would both have used one and they sell used for a good price. The Little Helper FunPod is definitely our top recommendation for a kitchen helper, but we'll look at some other options for comparison. Note that the FunPod has a closed-in design so you have to lift your child in and out. I see this as a bonus - I don't want my child climbing in and reaching kitchen counter-tops when I'm not supervising. The Guidecraft Kitchen Helper is a popular choice and has an award-winning design. It looks great in warm, modern maple and kids will love the cut-out shapes design and the built-in chalk board. The Easy Fold Kitchen helper folds for storage, but this does involve removing a screw. This is a great option for keeping at Grandma's house so the kids can help her bake. Some parent's have reported that kids use the cut-out shapes as footholds to try and climb out so young children should be supervised. Because of the large cut-outs, the Kitchen Helper is suitable for kids aged 3-5. Younger children may wriggle out of the large holes. 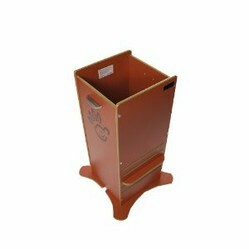 The Little Partners Learning Tower comes in a huge range of brilliant colors. The Learning Tower is big and sturdy and has open sides for children to climb in and out. 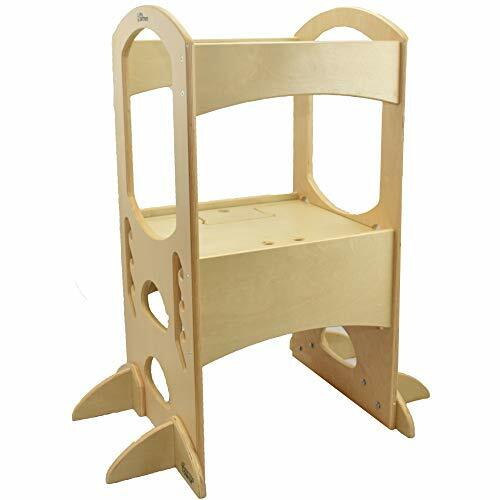 This makes it suitable for children from 3 up - smaller children are likely to wriggle out or fall. Parents report repeated painful tripping over of the feet of the Learning Tower by them and their children. The Learning Tower has a large weight capacity and can take two children - although there won't be much room and they will need to cooperate. This makes it a good option for twins - if they are skinny and even tempered! Dinosaur-themed snacks that are fun for toddlers and preschoolers. Toddlers can be really picky eaters, get some ideas for taking the stress out of toddler mealtimes. A selection of the best sleds for toddlers. Snow is lots of fun for 1, 2 and 3 year olds when they have the right gear. A selection of pull along wagons for toddlers. We've used a pull along wagon for our boys from aged one year up so I know what to look for. Very cool. I've never seen these. I can see how they would be much safer than a mere stool.